Judaism has long derived its identity from its sacred books. The book or scroll--rather than the image or idol--has been emblematic of Jewish faith and tradition. 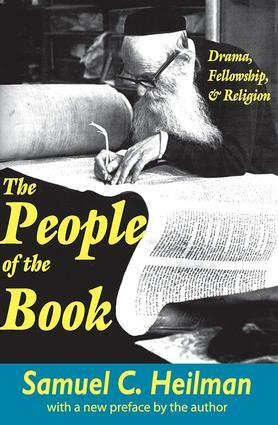 The People of the Book presents a study of a group of Orthodox Jews, all of whom live in the modern world, engaged in the time-honored practice of lernen, the repeated review and ritualized study of the sacred texts. In preserving one of the activities of Jewish life, Samuel C. Heilman argues, these are the genuine -People of the Book.- For two years, Heilman participated in and observed five study circles in New York and Jerusalem engaged in the avocation of lernen the Talmud, the great corpus of Jewish law, lore, and tradition. These groups, made up of men who felt the ritualized study of sacred texts to be not only a religious obligation but also an appealing way to spend their evenings, weekends, and holidays, assembled together under the guidance of a teacher to review the holy books of their people. Having become part of this world, the author is able to provide first-hand observation of the workings of the study circle. Heilman's study moves beyond the merely descriptive into an analysis of the nature and meaning of activity he observed. To explain the character and appeal of the study groups, he employs three concepts: drama, fellowship, and religion. Inherent to the life of the study circle are various sorts of drama: -social dramas- playing out social relationships, -cultural performances- reenacting the Jewish world view, and -interactional dramas- and -word plays- involving the intricacies of the recitation and translation process. This book will be of interest to anthropologists and those interested in the academic study of religion.